New Delhi: Dr Zakir Husain Library, Jamia Millia Islamia (JMI) organized an exhibition on “Prof. Mushirul Hasan in the light of his works” on 23rd January 2019. A condolence meeting was also organized in memory of Prof. Mushirul Hasan. The exhibition was inaugurated by former Vice-Chancellor of JMI, Syed Shahid Mahdi. The programme was well attended by dignitaries from various fields including Prof. Hasan’s wife Prof. Zoya Hasan, Prof. S.M. Azizuddin Husain, Dr H.J. Abidi, Mr Shahabuddin Azmi, Offg. University Librarian of Dr Zakir Husain Library, Faculty Members, Staff, Research Scholars and students of JMI. In his remembrance speech, Syed Shahid Mahdi applauded the unparalleled contribution of Prof. Mushir in building Jamia Millia Islamia. He reiterated that Prof. Mushir was not only an academician but also a cosmopolitan personality having knowledge in diverse fields. He advised keeping this exhibition on permanent display to provide inspiration to young scholars. Prof. H.M. Azizuddin Husain who worked very closely with Prof. Mushir also shared his thoughts. Prof. Aziz threw light on Prof. Mushir’s contribution in starting various Departments, Centres including a new University Library building. Prof. Zoya Hasan extended her gratitude for organizing this exhibition and called it an excellent and wonderful exhibition on Prof. Mushir’s intellectual and institutional contributions. Former librarian Dr H.J. Abidi also shared his experience as a research scholar of Prof. Mushir. Dr Abidi also told that Prof. Mushir was a regular visitor of the library, who used to give his ideas to improve the functions and services of the library. 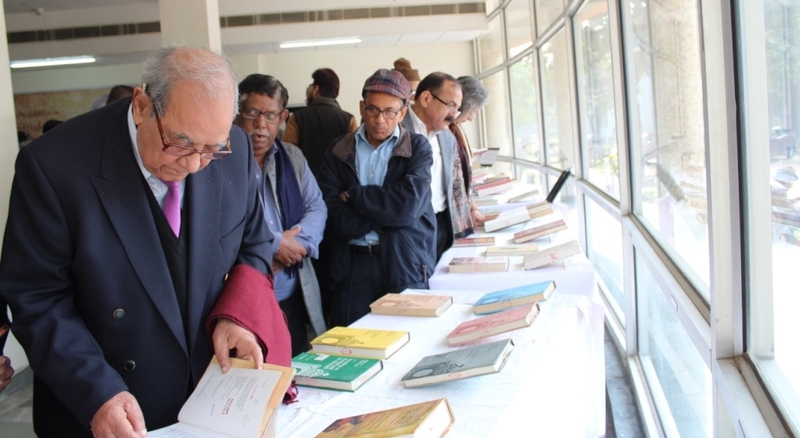 The exhibition depicts the works of Prof. Mushirul Hasan in form of his own written books, translated books, edited books and peer-reviewed articles. His contribution in the development of Jamia especially building up of the New building of Dr Zakir Husian Library has been depicted through some unseen photographs. A pictorial presentation of his life has also been displayed. The exhibition shall be on display from 23rd Jan- 1 Feb. 2019, 10.00 a.m. to 5.00 p.m. on all working days.